Everyone loves babies. 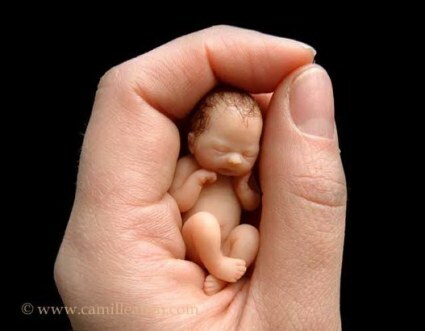 What better way to celebrate them than to have miniature sculptures that fit in the palm of your hand? 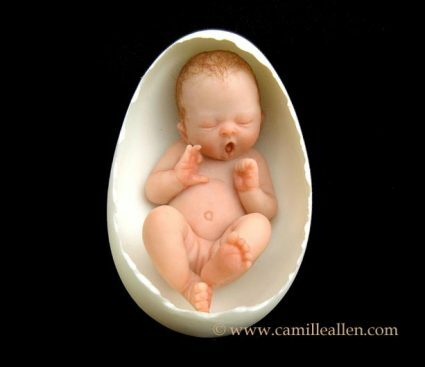 Artist Camille Allen creates very adorable baby sculptures that are sure to make you coo. 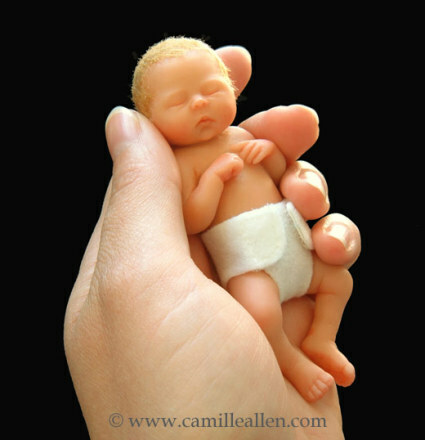 Camille lives in British Columbia, Canada and works in a large studio filled with dolls, doll parts, dolls-in-progress and sculpting supplies. She learned this art from her husband’s grandmother and was taught how to sculpt large lifesize dolls from polymer clay. 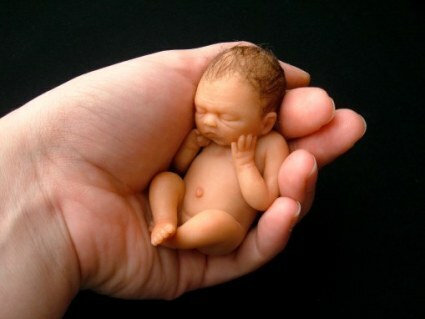 To create her mini sculptures, she uses various kinds of professional doll sculptors' clay. 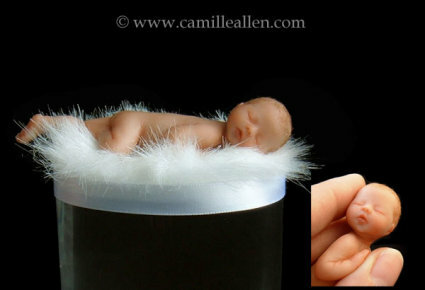 The babies have soft English mohair to imitate fine baby hair and are blushed with paints for realism to enhance their tiny wrinkles and creases. 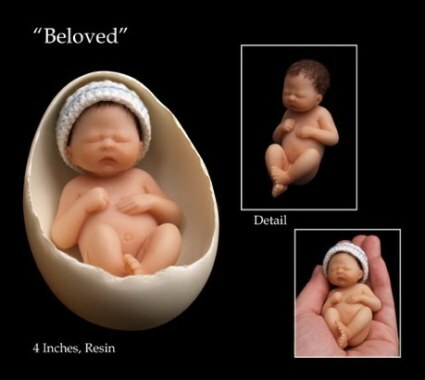 She starts with a detailed photograph and a lump of clay and creates either a lifesize sculpture or mini baby design. 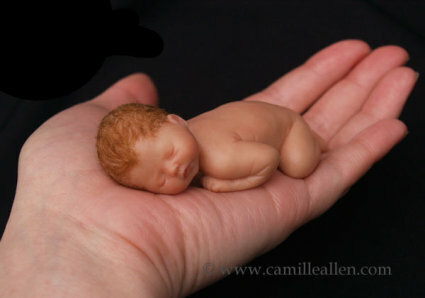 Many hours later, she forms a realistic baby and then adds the fine details, including wrinkles and fingernails. 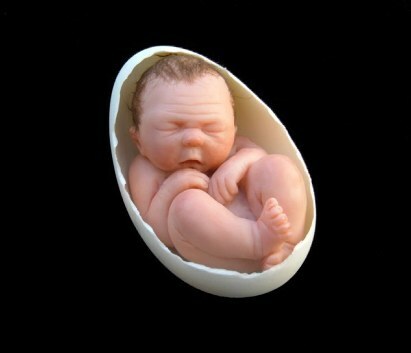 As for the price of one of these amazingly detailed sculptures, they range anywhere from $75 to $4000 for a one of a kind custom-made baby. 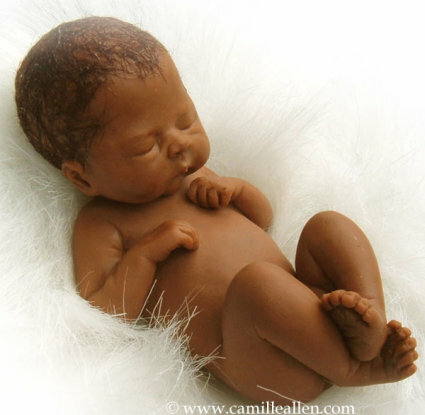 I love babies and have to say that out of all the art I have seen and written about, these baby sculptures are my favorite. 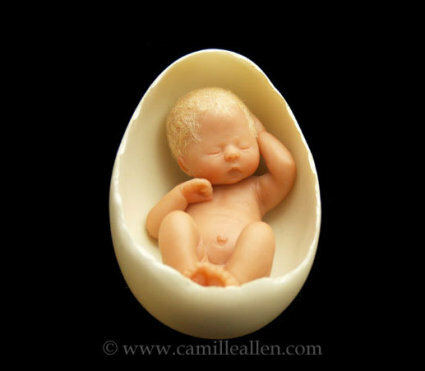 Camille is a very talented artist and I’d love to have one of these adorable sculptures in my home. Although, I love pinching baby cheeks but I think I’d have to be careful here or I’d ruin the sculpture. Does anyone out there own one of these? I’m so tempted to have one of these and would love to hear your opinions on them. My thanks to Camille Allen for her gorgeous artwork. Go Home Gorgeous: Mobile Spa Service Ready To Pamper Moms As Soon As Baby Pops Out! These Coffee Ads are Sure to Wake You Up! 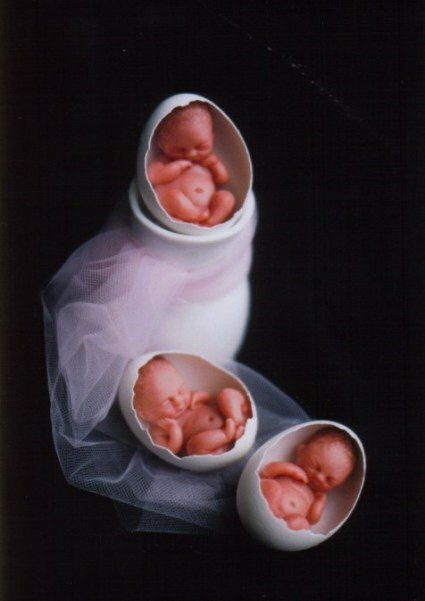 I'm sorry, but these are creepy! I think they are creepy too. can't imagine why anyone would think these are creepy since they're so lifelike and she's obviously a very talented sculptor/artist. i love them!